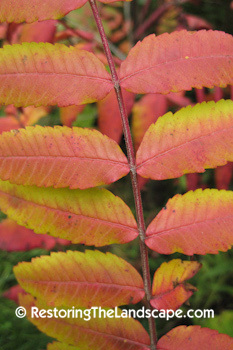 The Staghorn Sumac are in full color right now in Central Minnesota ranging from a rainbow of yellow through red on some leaflets to a very deep red pictured here. 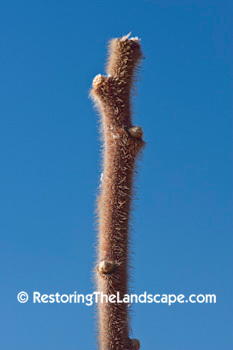 This is a large shrub to small tree reaching heights of 30 feet. Most often though, it is common in clonal clusters of 10-15 feet in height. This native can conjure up mixed reactions for many. It is considered by some overly aggressive in open, non wooded ecosystems with its suckering root systems. This bad reputation or abundance of this native is also due to the amount of disturbed habitats that humans have created and fire suppression. It is an early successional shrub species, taking advantage of open sunlit margins along woodlands, in disturbed openings such as along railways and any other tough places that other plants can't take footing. Staghorn Sumac has a very high wildlife value. 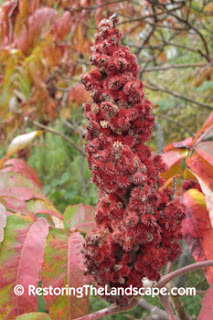 Staghorn Sumac gets its name from the hairy branches that resemble a stag's horns. The hairy stems are on the newest growth, the older ones become dark gray and smooth. 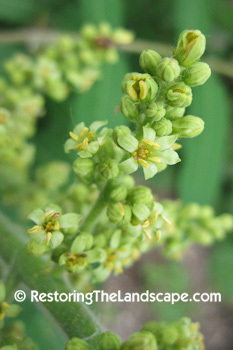 The flowers are a greenish yellow 5 petaled flower (separate male and female flowers) clustered in conical shaped inflorescences. I have seen many beetles and flies nectaring on the flowers. 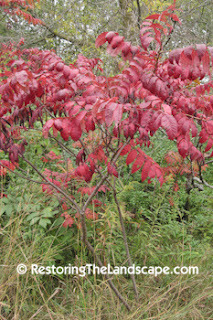 These sumacs flower from early June through July in Minnesota. Once pollinated, the flowers turn into a deep red fuzzy drupe. These drupe clusters persist into the winter and are picked at by birds and other wildlife mentioned above. These bright red fruit are a very nice ornamental characteristic of this native. The color alone can lift anyone's spirits on short, cold December days. 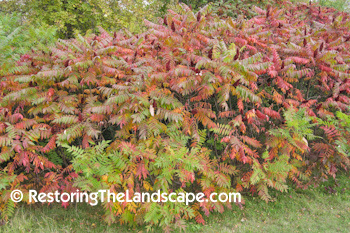 We planted Staghorn Sumac in our yard along a fenceline in an open sunny spot in gravel soil. It was the right plant for the spot due to the low hanging overhead wires and we could not accommodate anything that grew much taller. It creates a nice screen above the top of the fence, and within two years of planting it, it started to flower. It has begun to sucker, but these new shoots are easy to chop in order to maintain a tight cluster. I'm looking forward to watching the birds feed on the fruit this winter.